a variety of intelligence services by monitoring and analyzing data sources through advance statistical, linguistic, and crowd sourcing techniques. Delivers human analysis with effective fusion of human, social network and cyber based intelligence sources supporting real time decision making. STAM is able to organize intelligence collection and activities, their assessment and analysis production, and their subsequent dissemination to the various customers who have a need to know. It designs the intelligence reporting formats and processes that kept informed decision makers. Through specialized intelligence activities, STAM team is able to mitigate conflicts in complex environments. 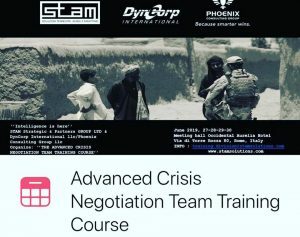 Through specific communication strategies, STAM teams are able to communicate with the parties in conflict to prevent violence and decrease deep-rooted tensions. For centuries the Italian experience in communications, has allowed to talk to everyone, managing to mitigate both internal and international crises, overcoming any cultural divide through action of specific intelligence. We talk with those with whom others do not speak, comparing ourselves to resolve crises and conflicts, creating liaisons. The SOC delivers a 24/7 security alert service on major security-critical event and anthropic risks (Terrorism, Narco-Terrorism, War, Civil War, Insurgence, Strikes & Riots, Kidnapping, Default, Political Interference, Illegal Detentions & Missing Persons), in the region through the Information and Intelligence, management division , using a special team of experienced Humint field officers. Clients also receive authoritative ‘’post incident analyses’’ to advise on how security events may impact their business & personnel. Sitrep is a series of every week updates, principal briefings, board summaries and alerts on security- related issues. These Situational Reports (SITREP) cover a wind range of countries in the Middle East, Africa, Eastern Europe, South America and the Pacific Rim. RRT’s provide expert assessment on developments which may impact on a Client’s specific interests and concerns. Humint Div. uses a statistical approach to underpin its qualitative research and tailors the data being measured to a list defined, agreed and kept under constant review with STAM s’ clients. The commissioned report allows a Client to task Humint Div’s expert team on single issues of very specific – and often highly confidential – interest to their business. Humint Div. coordinates its reports with an internationally-recognized polling organization that can add significant insights to our research into countries, locations and specific issues. The EIB gives clients the chance to hear expert and authoritative briefings across the full range of threat and risk issues. Humint Div can arrange these briefings either in conjunction with the above reports, or as a stand-alone service. The Analyst and Assessment Detail provides clients with the services of our expert analysts whether for a limited period to complete a specific piece of research, or to work full-time with your corporate security team.